After studying at Croydon College, Trent Polytechnic and the Royal Academy Schools sometime last century Martin has exhibited extensively. He has screen prints in the collections of the Victoria and Albert Museum, The House Of Commons and University College Hospital, London. His work is often selected for the RA Summer Exhibition, most recently this year with his print The Royal Academy of Procrastination. An accomplished screen printer Martin favours hand painting stencils on to the screen, eschewing photographic and digital techniques. 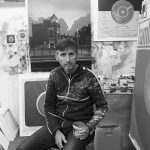 Through this process he creates unique, richly layered prints often capturing views of Brixton, West Norwood and beyond. In the more haunting, melancholic pieces that are on display here he has achieved a slightly more surreal and dream like quality, the images have a mysterious and enigmatic resonance. 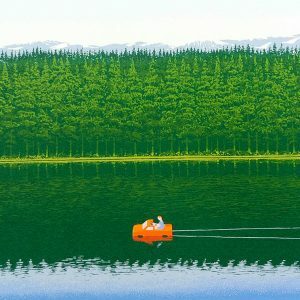 Whether interpreting anecdotes and songs or illustrating little scenes from the passing world that have caught his eye the resulting artworks fit perfectly into the theme of the current exhibition.